Allandalers: We still need parade judges! We're looking for twosomes per category, so grab your best buddy and volunteer. It's great fun, and you get to award great prizes donated by area merchants. If you're interested or have any questions, please email allandale.neighborhood <at> gmail.com. How do we find out what the categories are? 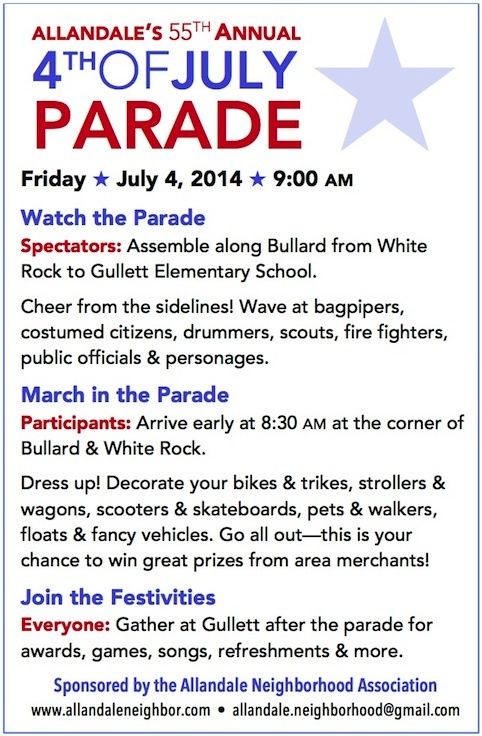 Arrive at 8:30 a.m., corner of Bullard@WhiteRock, look for the signs to line up in your category!